Short Courses are offered in conjunction with SMDM meetings and conferences and are an excellent way to learn from experts in the field. 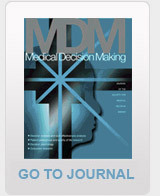 SMDM Members can access a wide variety of resources in medical decision making, including the EQ-5D Index Score Calculator and more. The SMDM Career Development Committee offers one-to-one mentoring at its Meetings and Conferences. SMDM Members can search job and fellowship postings for positions directly related to medical decision making. Advertise your job or fellowship position in the SMDM newsletter and on the SMDM website! SMDM Members can post their CVs in SMDM Connect. Other members will be able to find your CV and learn about your research. SMDM Members have access to course syllabi posted by other members. Members can also post syllabi they have developed. SMDM offers a Certificate of Completion to individuals who complete the SMDM Core Courses.